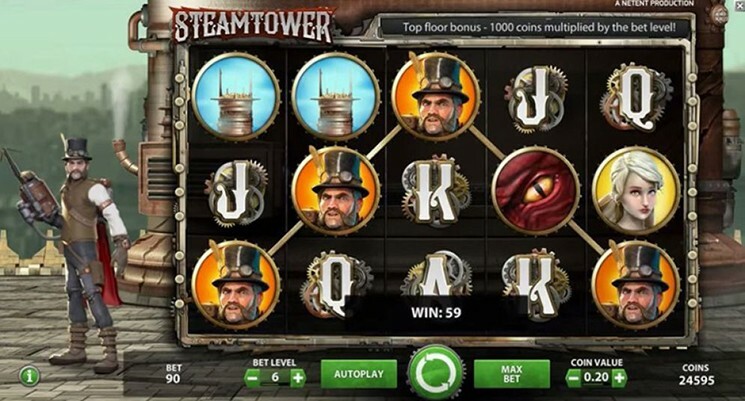 Steam Tower is a five reel and 15 paylines video slot powered by Net Entertainment software provider. Video slot takes its inspiration from 19th century’s Victorian era, Englands industrial revolution. Steam Punk design of the video slot gives you that old school feel. Low paying symbols are standart playing card symbol enhanced with steampunk overhaul. High value symbols are “top of the tower”, male and female steam punk characters and dragon eye. Before investing real money players can try Steam Tower Slot for free, or visit any Net Entertainment casino such as: Mr.Bet Casino, Company Casino, Mr Green Casino and others to play with real money and win. Before you visit Englands Steam Punk era, your wager need to be placed. Like in many other NetEnt video slots all the buttons are mostly the same. “Coin Value” ranges from 0.01 to 1, whereas “Bet Level” goes from 1 to 10. With “Max Bet” you start the game with already highest bet amount which is “150$”. With “Autoplay” you can choose number of spins that will go without stopping. “Spin” is a giant button in the middle. There are two main thing you need look for playing Steam Tower, which are Stacked Wilds and Free Spins. Free Spins feature activates when Stacked Wild symbol appears and covering whole reel during main game. You will be awarded with 10 free spins. Also you will be relocated to first floor of the tower which you need to climb up to rescue the princess. There are sixteen floors in total and when feature activates you start climbing. On the Top Floor you will be awarded with the Multiplier that will go up to x7. In addition you will be awarded with bonus spins for every Wild symbol that hits the reels during this feature.